Tim and I will see you for Whitewater Demo Day at the Gutter, Tuesday, July 10th and 31st, 5pm. 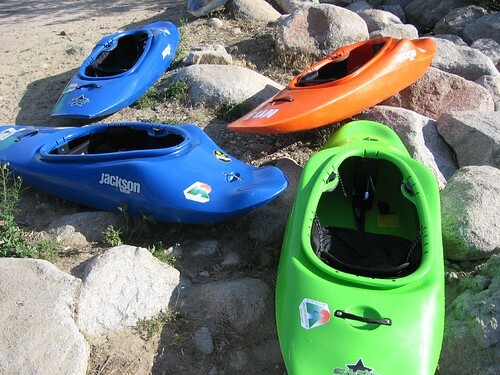 Alpenglow will bring all of the Jackson Kayak models available for you to try for free! Having an Eskimo roll is required. Bring your own accessories as they will only have a small quantity of skirts, Pfd’s, and Paddles. Call Alpenglow at 331-BOAT(2628) with questions! Now I had not heard of Hydrospeeds until this year. 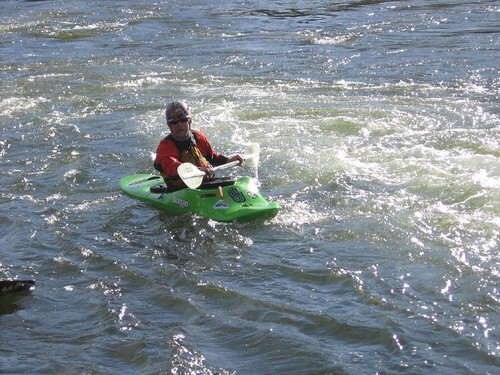 We had a guy Hydrospeeding our trip down the Cabarton section of the Payette on Saturday. Now I don’t think I’m going to trade in my Jackson for one, but they do look fun! Cascade Kayak School is actually running trips on them. Here is a short vid in case you haven’t seen them. Outstanding…that is all I can say. I took my first run down from the Cabarton Bridge to Smith’s Ferry. This is more of a wilderness run than the Main Payette – winding in a valley off the road for about 9 miles before following the road from Rainbow Bridge to Smith’s Ferry. We looked like an armada with a raft (7 people), 8 hardshells, 2 IKs, and a hydrospeed. Somehow we kept track of everyone. Fun class II’s with great spots for eddy turns. Big – long class III’s and the final monster drop at Howards Plunge (III+). If you’re looking for a day long float with a big class III and a remote feel – the Cabarton is the run for you! Demo the New Jackson Kayaks at the Gutter! 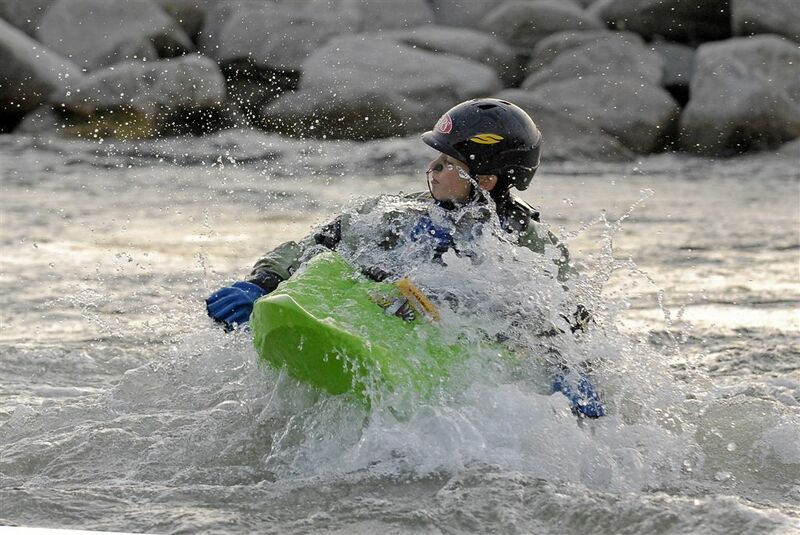 Whitewater demo day at the Gutter, Tuesday, June 19, 5pm. Alpenglow will bring all of the Jackson Kayak models available for you to try for free! Having an Eskimo roll is required. Bring your own accessories as they will only have a small quantity of skirts, Pfd’s, and Paddles. 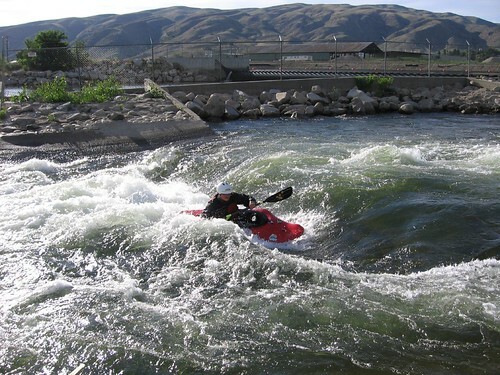 Boise’s proposed whitewater park got a jump start Thursday when Boise Mayor Dave Bieter announced that his proposed budget includes $750,000 in seed money for a quarter-mile whitewater park on the Boise River. The jump start was much needed for a park that has been on the minds of kayakers and city officials for about a decade. 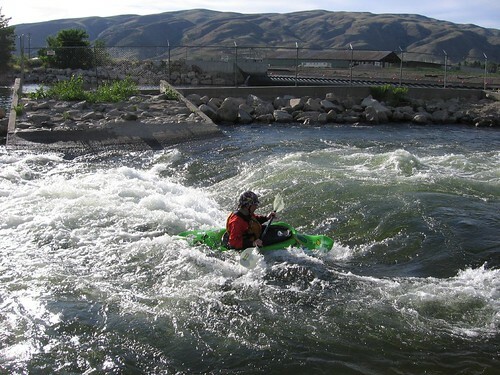 Whitewater boaters in the Boise area have been jealous of the whitewater park on the Truckee River in Reno. After all, we thought of it first. But Nevadans jumped on the idea, pumped money into their project and are reaping the benefits of tourism and an incredible city amenity. Practically every ad you see for Reno has a kayaker in it. 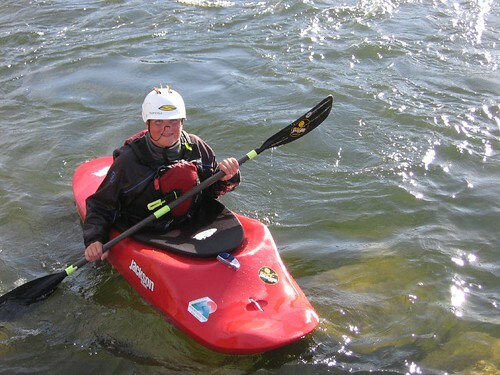 It is luring whitewater competitions, tourists who want to take kayaking lessons and people who want to go downtown and just picnic by the Truckee River. It also lures anglers. 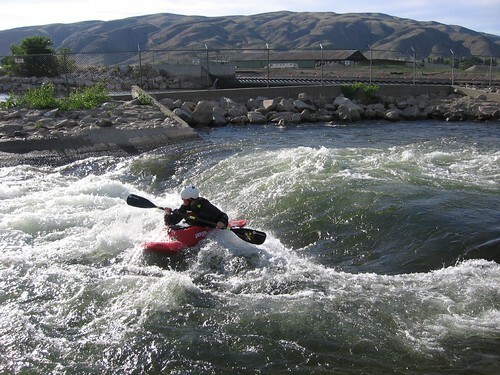 We call Boise’s proposed park a whitewater park because it will have rapids and play areas for kayakers and canoeists. But it is more than a whitewater park. It is a river park. It will be a place where Greenbelt goers can sit on the side of the river and have a picnic. It will be a place to sit on an improved river bank and watch birds, read a book or even watch fish jump. Yes, the river park, just upstream from Veterans Park, also will improve trout habitat. Right now the area is a mess with concrete, re-bar and other unsightly debris from irrigation diversions and past industrial use. The park is a chance to create part of the river that will be trout friendly. Yes, it’s good to jump start for Boise’s river park. Thanks Mayor Bieter. I owe you a river trip.